In part two of our interview with Team Tyne Innovation following their record-breaking Atlantic rowing challenge, we spoke to Phil Kite and Claire Hughes about the satellite communications equipment supplied by Satcom Global, and how it contributed to their journey. What did you use the Iridium GO! and Iridium 9575 Satellite Phone for? Phil: We used the phone to contact the race duty officer on a daily basis and the Iridium GO! for emails to our social media / PR support team on land. Did the satcoms play a part in your daily routine? Phil: Satcoms support had a massive part to play – enabling us to communicate with ease was great for crew morale, and if things had gone pear-shaped could have helped save our lives. Did you find the equipment easy to use? Phil: Yes – I am not an IT expert but the kit (an Iridium GO! and an Iridium Extreme 9575) was almost idiot proof, so it was easy to use. How reliable did you find the satellite connection – weather conditions? Different locations? Phil: Obviously in a bouncing 9m boat in the Atlantic Ocean communications weren’t always straight forward, but I don’t remember a time when we didn’t manage to connect! What was the main benefit of having the satellite communications during your challenge? Have you got any examples of important messages or information you needed to get back to shore – either to the race team or friends and family? Phil: The ability to contact people at a drop of a hat; when our water-maker went down which could have been a race over situation, we were able to contact the UK manufacturer which was fantastic. Also weather information was critical if there were storms coming. How important was it to be able to keep in touch with family / friends? Claire: As previously mentioned, communications were essential with race officials and weather routers etc. Communications with family and friends was a bonus which allowed us to understand what the other crews were up to and how we were doing in relation to them which was really motivational. It also allowed lots of messages of support to be shared with us which again was a real lift on a tough day. How important was it for you to be able to send information and content such as blogs back to shore? Phil: We found out post-race that these helped supporters and sponsors understand the challenges we were facing and got everyone excited about what we were doing. What do you think it would have been like not to have connectivity for long periods of time? Claire: Zero connectivity for long periods of time would not have been a total disaster; however it would have made our crossing a lot harder and probably a lot longer. Crucially, it would have meant we could not have had weather forecasting information which was so crucial to informing our route selection. How important was the support you received from Satcom Global? 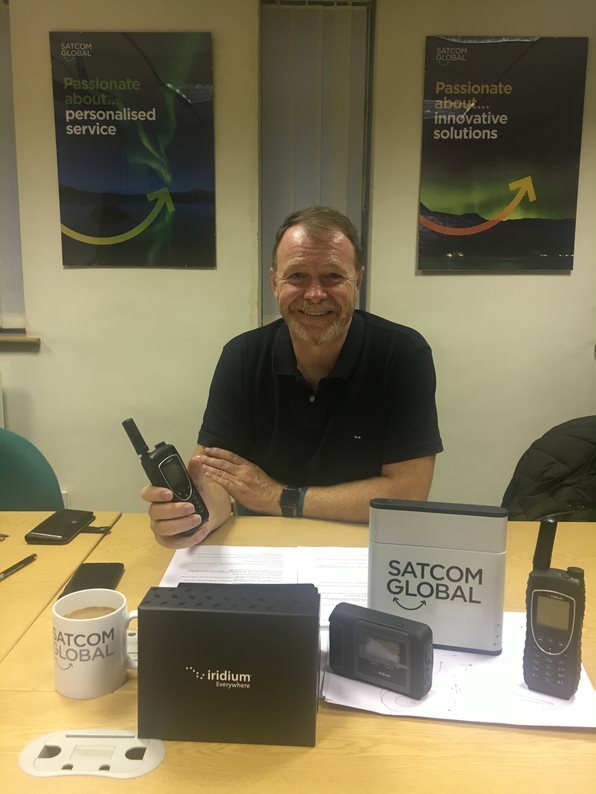 “ Satcoms support had a massive part to play – enabling us to communicate with ease was great for crew morale, and if things had gone pear-shaped could have helped save our lives"